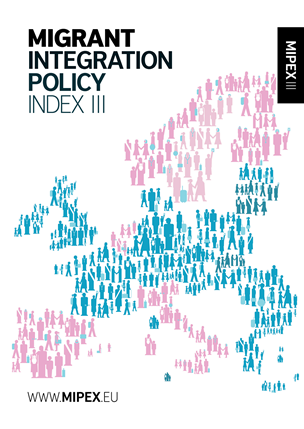 The Migrant Integration Policy Index was first published in 2004 as the European Civic Citizenship and Inclusion Index. It was the first time that the policies of the EU-15 towards migrants had been presented in a concise, transparent and comparable format. The 2004 Index was positively received by target audiences - NGOs, governments, academics, press and European Institutions such as the European Commission and European Parliament. It was launched in Brussels, Madrid and London. The 2004 MIPEX was a collaboration of the British Council, Migration Policy Group, Foreign Policy Centre and University of Sheffield. It was part-funded by the Barrow-Cadbury Charitable Trust and Joseph Rowntree Charitable Trust. The second edition of the MIPEX, conducted in 2007, measures policies to integrate migrants in 25* EU Member States and Canada, Norway and Switzerland. 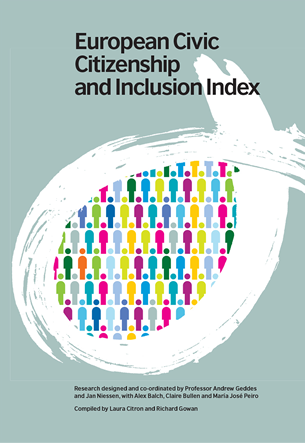 It uses over 140 policy indicators covering six policy areas which shape a migrant’s journey to full citizenship: Labour market access; Family reunion; Long-term residence; Political participation; Access to nationality and Anti-discrimination. The MIPEX II was launched to the international press in Brussels in October 2007 followed by national events across Europe to stimulate discussions and debate. *The MIPEX II application was accepted prior to the accession of Bulgaria and Romania in January 2007. The MIPEX II partnership was led by the British Council together with MPG and co-financed by the European Community under the European Commission DG Freedom, Security and Justice INTI (Integrating Third Country Nationals) programme. The British Council and Migration Policy Group led a Network of Partners comprised of 25 partner organisations, with Research Partners at Sheffield University and the Université Libre de Bruxelles. Danish Institute for Human Rights (Denmark); INED (France); Friedrich Ebert Stiftung (Germany); Institute of Public Affairs (Poland); NCCRI (Ireland); Fundació CIDOB (Spain); King Baudoin Foundation (Belgium); Association for Canadian Studies (Canada); e2 (Finland); Hellenic League for Human Rights (Greece); Synigoros (Greece); Menedek (Hungary); Fondazione ISMU (Italy); ASTI (Luxembourg); FORUM (The Netherlands); Norway´s Contact Committee for Immigrants and the Authorities (KIM) (Norway); Gulbenkian Foundation (Portugal); CEIFO (Sweden); SFM (Switzerland); Commission for Racial Equality (UK); Immigration Advisory Service (UK). The 5 migration experts sitting on the Index scientific advisory committee were Prof Joaquín Arango; Prof Virginie Guiraudon; Prof George Kolankiewicz; Prof Marco Martiniello and Prof Rainer Baubock. The third edition of the MIPEX, conducted in 2011, measured policies to integrate migrants in 27 EU Member States and Australia, Canada, Japan, New Zealand, Norway, Serbia, South Korea, Switzerland and the USA. 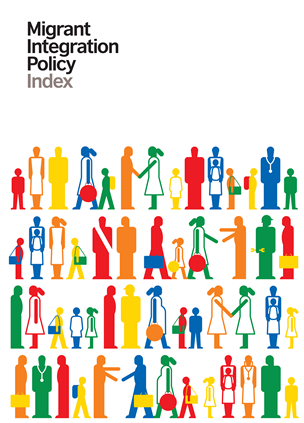 It used over 148 policy indicators covering seven policy areas which shape a migrant’s journey to full citizenship: Labour market mobility; Family reunion; Education; Political participation; Long-term residence; Access to nationality and Anti-discrimination. The MIPEX III was launched to the international press in Brussels in February 2011 followed by national events across Europe to stimulate discussions and debate. The MIPEX III partnership was led by the British Council together with MPG, was produced as part of the project ‘Outcomes for Policy Change’, and was co-financed by the European Fund for Integration of Third-Country Nationals. The British Council and Migration Policy Group led a Network of Partners comprised of 35 partner organisations, with Research Partners at IPSE of London Metropolitan University, the Université Libre de Bruxelles, the University of Szeged and the University of Konstanz. Counselling Centre for Migrants (Austria); Settlement Council of Australia (Australia); King Baudouin Foundation (Belgium); Open Society Institute (Bulgaria); The Maytree Foundation and The Association for Canadian Studies (Canada); Action for Equality, Support and Anti-Racism (Cyprus); People in Need and Multicultural Centre Prague (Czech Republic); Danish Refugee Council (Denmark); Think Tank e2 (Finland); Terra Nova and France Terre d’Asile (France); The Heinrich Böll Foundation (Germany); i-RED Institute for Rights, Equality & Diversity and Hellenic League for Human Rights (Greece); Menedék Hungarian Association for Migrants (Hungary); Immigrant Council of Ireland (Ireland); Fondazione ISMU (Italy); Providus (Latvia); Institute for Social Research (Lithuania); ASTI Association de Soutien des Travailleurs Immigrants (Luxembourg); FORUM Institute for Multicultural Affairs (Netherlands); KIM Norway’s Contact Committee for Immigrants and Authorities (Norway); IPA Institute for Public Affairs (Poland); Calouste Gulbenkian Foundation (Portugal); The Soros Foundation Romania (Romania); IVO Institute for Public Affairs (Slovakia); CIDOB (Spain); Swedish Red Cross (Sweden); SFM Swiss Forum for Migration and Population Studies and Lucerne University of Applied Sciences and Arts (Switzerland); Runnymede Trust and Immigration Advisory Service (United Kingdom); Immigration Policy Centre – American Immigration Council (USA).